Man, it has been awhile since I’ve written a blog entry. The last time was last summer when we took a whirlwind 11-day vacation on the island of Kauai. That seemed so long ago. I was looking at my past blog entries and I realized that on my 1st entry, whenever I start a new adventure/vacation, it always goes back to how crazy life has been on our end. Since coming back from Kauai, all 4 of our kids have gone back to school. Ethan is now a freshman, and he played football for Camarillo High School. Our Thursday nights have been devoted to watching him and his team dominate the league. After 10 games, they emerged as the league champions with a record of 9-1. Madison, on the other hand, is now 12 years old. She kicked off her school year with a huge birthday party and celebrated with over 50 young tweens. Yes, we managed to host a party that was attended by 7th graders from her school. It was an afternoon and evening that I will never forget. It was loud, crazy, okay fine…it was fun…but tiring. Our two little chicks, Evan and Caitlin have had their own set of adventures. They are now in 1st grade and 4th grade. We are back to working on homework night after night. When we’re not doing homework, we found time going to the pool, or the library, and at some point, we managed to teach Caitlin and Evan to ride a bike. I, myself, have had my fair share of craziness. My busy travel schedule came to a halt in June. Prior to June, I must have traveled close to 10 times going back and forth to the East Coast for work, and sometime during the Spring, we went to Europe (Italy and France) and took 2 of the kids on a Spring Break-cation. However, after my last business trip in June, my travels have ceased, and I was able to get back in the swing of things here at home. That didn’t last very long. That all changed in October and November – 3 back to back trips required me to go to New Jersey and New York City. The first 2 weeks of November was unreal. I came home from the East Coast on a Thursday night, and a few days later, I flew back to the East Coast again. It is now close to midnight on Wednesday. I am exhausted. Tired from all the travel, and burnt out from work. I am not complaining though. I thrive when things are a bit kooky. I seem to flourish when I have to multi-multi-multitask. So up until 11pm this evening, I tried to finish up my work, and prepared detailed instructions for the person who will be covering for me while I’m away. Let’s talk about fun things now….Europe. A few months ago, I was featured in an article written by a leading travel blogger known as The Points Guy. I shared my success story in booking a 2-week trip to Europe (London, Budapest, and Prague) – including all the airfare, and all hotel stays. For how much? All for a whopping $349. Yes….that’s it…..and that’s the total amount for me and Nancy. How did I manage to do this? I racked up points and miles (not from all of my business trips), but points and miles earned from credit card sign-up bonuses. Click here for the article Making Family Vacations Affordable. After we came back from our Spring Break trip to Italy (Venice, Milan, Florence, Pisa, Lake Como), and Paris, France, Nancy and I decided to use our points and head back to Europe in the Fall, this time, it’s just the two of us. I did my research and found the hotels and airfare for the the trip, and by June 1st of this past summer, I had everything booked…Europe here we come! Early this year, I made a commitment not to make any more resolutions. My mantra these days is to forget making resolutions, just make the decision and commit to it. And that’s exactly what we did, we saved up enough points to make this dream trip work, and it was time to execute. Now, we are a only few hours away from boarding a plane en route to our first London trip ever! We planned this 5-6 months ago, and one would think that we’d have all the time in the world to prepare for the trip. However, it wasn’t the case. I am just going to rely on good ol’ TripAdvisor assistance, and use a site called VisitACity to get clues, ideas for an itinerary. Other than that, just like the way we’ve done in Hawaii, we’ll go with the flow, and see where the day takes us. That in itself should be an adventure. Did I listen to my feet? If you followed my blog when we were in Paris, I did make a note that I threw away my Doc Martens. It was a perfect pair, a pair that I used many times in New York. But walking around Europe required more, and more walking. My feet were killing me. So about the “decisions” – I decided it’s time to find comfortable shoes. I love walking around with my Nike running shoes. They’re the most comfortable shoes sent from Nike heaven. But, I didn’t want to just walk around in sneakers. So I shopped for black shoes, brown shoes…the slip on type. Shoe lace? Who’s got time for that? I searched high and low at the Factory Outlet (Rockport, Timberland, Bass, Sperry Topsider, Bass). 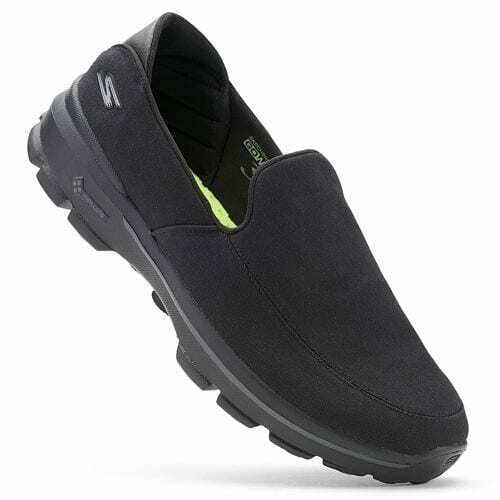 Over the weekend, I narrowed the search down to these black Merrell shoes. But the shoes were still pretty heavy. Then last night, on my birthday, Nancy and I went back to the outlet and by chance we stopped at Skechers and tried on their GoWalk3’s. OH. MYYYYYYYYYY!!! It’s like walking on yoga mats, layers of yoga mats. It’s got shock absorbing soles. It may not be the most attractive of all shoes, but I know I will thank Skechers later for saving my feet from hurting….let’s hope. After writing my blog entry last night, I told Nancy I didn’t have the energy anymore to pack. I knew that Thursday will be an even crazier day. I still had to work. Our flight out of LAX is scheduled to leave at 4:55pm. I spent all morning on back to back conference calls, worked on my expense reports, and spent time taking care of my project deliverables before I head out for vacation. The very first thing Nancy asked me when we woke up, “you had time to write your blog last night?” Bahahahaha! Yes, call me weird. But that was my way of decompressing. After a very busy stressful day, I gathered my thoughts and blogged about it. On top of the crazy work activities, I had to say quick goodbyes to the kids as they went off to school. They asked, “Who’s going to cook us a Thanksgiving feast? What about Black Friday, Daddy?” Hahahahahaaha, they will be in good hands with the rest of our family who will be staying behind. I’m sure our family will spoil them over the holidays. But I will surely miss them. I will leave our communication all up to FaceTime, Viber, Skype, Facebook, Instagram. We will find a way to stay closely connected. WTP – What to pack? Well, I’ve been dreading what to pack? Will it be rainy? Cold? Will there be snow? Well, this morning, I just remembered that in 2007, Nancy and I went to Paris and Rome directly after Thanksgiving. It did rain or showered on some days, but it wasn’t terrible. So I am packing as if I’m headed to the East Coast – sweaters, jackets, beanies, scarves, and will bring layers of clothing. I’ve been in many situations where I’m all bundled up due to the frigid temps outside, but once I entered a restaurant, bam, I started to sweat due to the heater. So it’s all about layers of clothing. Out of nowhere, I told Nancy, “don’t forget to bring your swimwear!” – hahaha yes. I learned that from all the traveling I’ve done. Even in the cold winter months, I might be fortunate enough to stay in a hotel with a heated indoor pool or jacuzzi – so that should help us as we wind down from a busy day of walking. Well I have more packing to do, so I guess, I better finish this blog. So there you have it, that’s my first blog entry for this back-to-Europe vacation. Many adventures await, and only time will tell. I don’t know if I’ll be able to write a daily blog, with the time difference and all, it’s going to be a little hard. But we’ll see what the next few days will bring. This is all for now, thank you for following our journey. Day 1: Flying across the pond, we’re in London, baby! !